Even though it falls in the heart of playoff contention, the NFL has not embraced Christmas Day games like it has Thanksgiving Day games(a void which the NBA has stepped into eagerly). In fact, there had never been an NFL game on Christmas Day through its first 50 years of existence, prior to the 1970 AFL-NFL Merger. 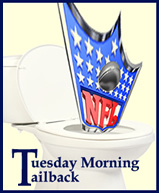 In those days, the NFL regular season usually ended in mid-December with the only postseason game being the NFL Championship Game held on the Sunday two weeks later and, in the rare cases when that Sunday fell on Christmas Day, the league moved the championship to Monday, December 26th, as it had in 1955 and 1960. The first NFL games actually played on Christmas were the 1971 divisional playoffs. The first was an early afternoon game between the Dallas Cowboys and the Minnesota Vikings at Metropolitan Stadium in Bloomington, Minnesota. 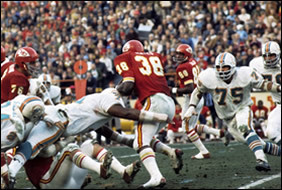 The late afternoon game that same day was a historic contest between the Miami Dolphins and Kansas City Chiefs at War Memorial Stadium in Kansas City, which wound up being the longest game in NFL history. The NFL received numerous complaints because of the length of this double-overtime game which stretched well into the evening, wreaking havoc on Christmas dinners across the nation. For this reason, the NFL decided to not schedule any Christmas Day games for decades. The 1977, 1983, 1988 playoffs avoided Christmas Day by featuring games on Saturday, December 24th and Monday, December 26th. In 1989, the regular season extended beyond Christmas and the NFL tried another Christmas Day game with the Cincinnati Bengals and Minnesota Vikings meeting at 9 pm for Monday Night Football (therefore avoiding interfering with family dinners). There have been occasional late-afternoon or night games played on Christmas Day (no game starting earlier than 5 pm Eastern) since 1989. The latest being last year on Sunday, December 25, 2011, when the Green Bay Packers hosted the Chicago Bears at Lambeau Field on NBC Sunday Night Football. Under the current television contract, which runs through 2022, neither CBS nor FOX can carry a Christmas Day game, which means this rare tradition will likely become even rarer.